MSV: Ravimobile controversy explodes: pimpmobile or to be pimped out, that is the question? Ravimobile controversy explodes: pimpmobile or to be pimped out, that is the question? 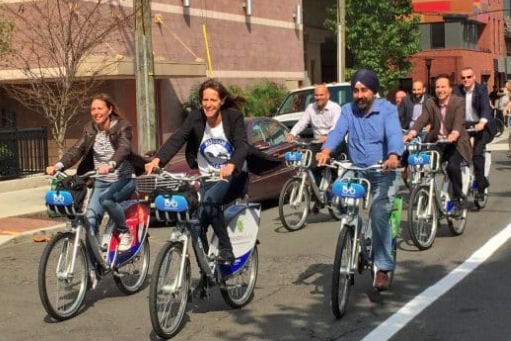 A nine-page letter issued by Hoboken Police Chief Ken Ferrante to this website late Friday on the Ravimobile attempted to dispel a growing public controversy on its purchase, cost, and usage by Mayor Ravi Bhalla. Pimpmobile or to be 'pimped out' - let the public decide! The defense of a gas-guzzling green-killing $63,000 SUV fondly called by some a 'pimpmobile' has been left to Hoboken Police Chief Ken Ferrante as the mayor's office and Ravi Bhalla remain silent on a growing public backlash. Members of the City Council allege they were never told of the actual reason with the approved purchase with a fleet of five police vehicles approved last summer at its August 1st meeting. In the lengthy nine-page letter, the Hoboken Police Chief differs with commentary on various social media, blogs and this website, among them that the $63,000 Ravimobile is not "pimped out." The letter, however, admits belatedly near the end the Ravimobile with an HPD security detail was used to chauffeur Ravi's children to school at Elysian Charter. The letter also outlines family use for the Ravimobile's chauffeured trip to the governor's mansion but makes no mention of the Atlantic City political junket exclusively reported by MSV. Primarily, the letter responds to deemed erroneous social media posts likely connected to Councilman Mike DeFusco and questions submitted in writing by Councilwoman Tiffanie Fisher before concluding, "I hope this report will correct those feelings." But that's unlikely as the report left at City Hall in the mailboxes Friday afternoon of council members Mike DeFusco and Tiffanie Fisher and the letter disseminated shortly thereafter by email to h-MAG, MSV and the propaganda website of Ravi Bhalla's paid political operative Nancy Pincus at Sybil's Cave. That blog has become notorious for its fanatical support for Bhalla, fabricating savage attacks on City Council members often directed right out of the mayor's office. a $63,000 gas-guzzling anti-green 2018 Ford Expedition SUV truck. The HPD letter makes no mention of the role played by the mayor's office and/or Ravi Bhalla in how the gas-guzzling 2018 Ford Expedition SUV was purchased. Also missing is clarity surrounding how the City Council wasn't told by the Bhalla Administration of the Ravimobile's real purpose leading to its purchase last summer. 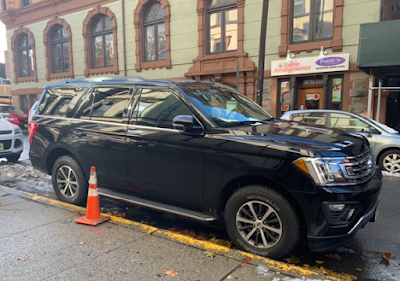 The super-sized SUV, a 2018 Ford Expedition was purchased last summer and listed as an approximately $63,000 charge by the mayor's office with the City's regular bills, not an expense from the Hoboken Police Department. It's charged in the City's capital budget highlighting responsibility of Ravi Bhalla and the mayor's office for an explanation. MSV originally broke the story on the Ravimobile last month in its "Sign of the Times" photo essay column and then followed up detailing its full cost to taxpayers at $63,000. A cursory search of 2018 SUVs shows dozens of models with many SUV hybrid choices. Almost all the SUV choices come in at significantly less than the $63,000 gas-guzzling 2018 Ford Expedition. got him elected is a problem to present elevating security concerns. It's all part and parcel of the growing Ravimobile controversy. 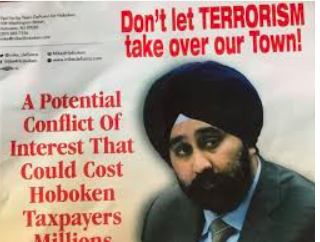 Talking Ed Note: Perhaps security concerns would be lessened in retrospect IMHO, if a Terror Flyer depicting Hoboken residents as racists hadn't been deployed to see him elected to public office a third time with 32% of the vote. As MSV stated in its earlier TEN, many in the Hoboken public will be leery to criticize the public safety aspects of the Ravimboile but its cost and usage are of significant public interest/concern. Police Chief Ken Ferrante has been doing a superlative job leading the HPD. However one views the nine-page letter, it's more octane on the Ravimobile pyre. The police chief has a big job to do for Hoboken, so it's up to the public to keep an eye on the Ravimobile and its usage. The nine-page letter linked atop this feature story is also linked here. Related: The MSV Sign of the Times photo essay that broke the Ravimobile story last month is here and the follow-up with additional details is here.